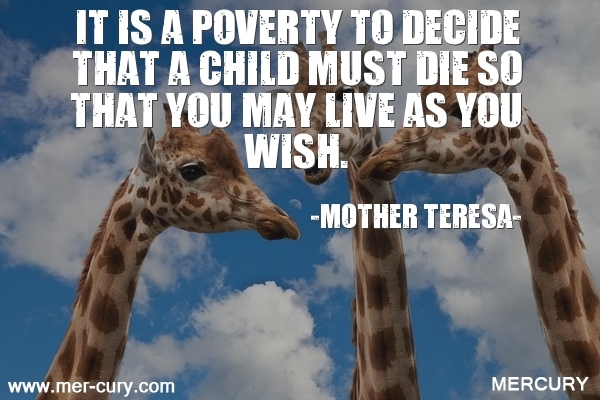 Mother Teresa was known for giving. She devoted a lot of her life to helping the poor and the sick, and she received a Nobel Peace Prize for the work that she did. 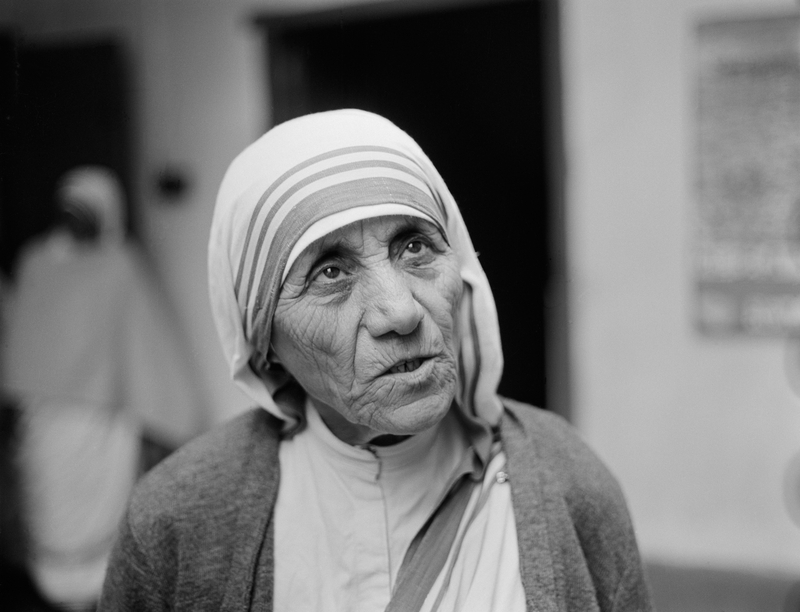 Her 87 full years of living a life that most of us couldn’t imagine are what gives Mother Teresa quotes such weight. Whether you are religious or not, her experiences in life made her a wise woman. 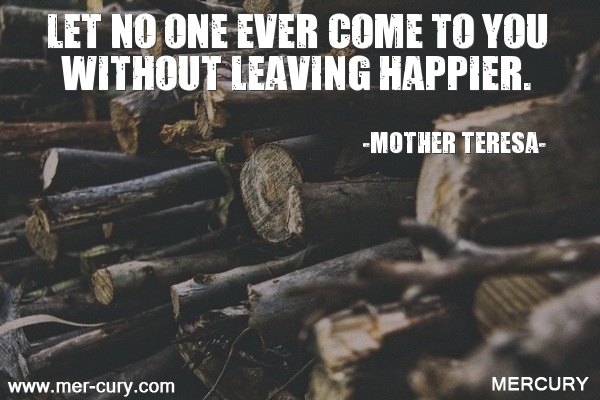 The following Mother Teresa quotes on life are good reminders of how to live each day. 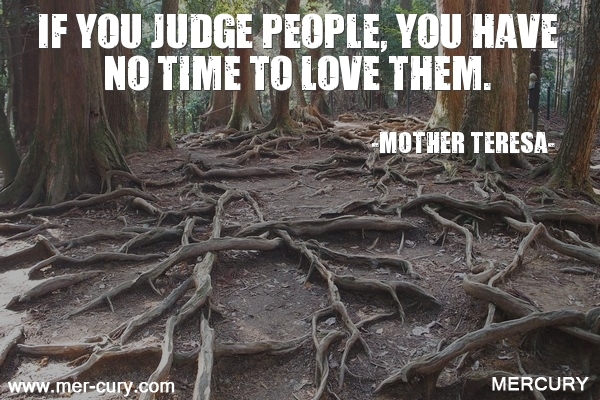 When was the last time you judged someone? Today? Probably! As humans we are built with the capability to judge others to an inch of their life. But, we judge them based on our opinions and beliefs, not on the truth. We don’t know what others are thinking. We don’t know what makes them do what they do or what their intentions really are. So why do we judge? 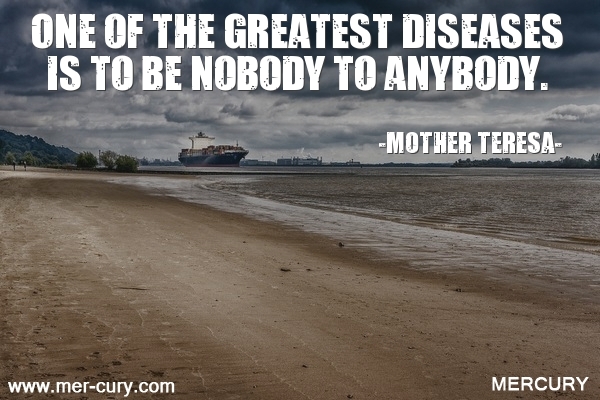 Mother Teresa was focused on loving other people, and she understand that judging took away the capability to love. If you are too busy pointing a finger at other people, you can’t stop and feel connected to them in any way. Instead, you feel repelled by them, which puts a distance in between the two of you. In other words, instead of judging people, make your time about loving them for who they are and you will develop stronger relationships. Do you know how powerful your words are? They have the power to start a war or promote peace. They have the power to make someone hate you or love you. 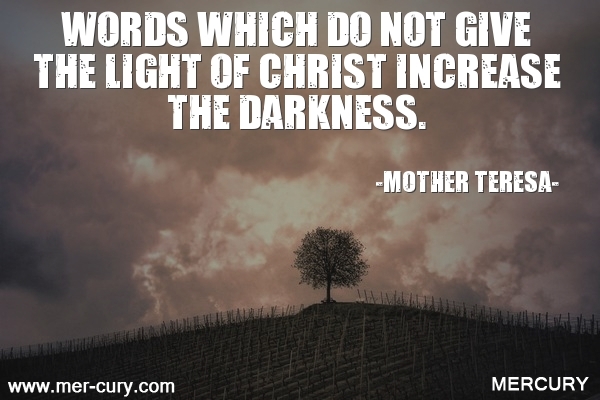 This is one of those seemingly religious Mother Teresa quotes, but the reality is that your words can increase the darkness on a daily basis in your life if you don’t choose them wisely. There is a lot of talk about negative and positive affirmations. They are something you need to pay attention to. You are always speaking negatively or positive to yourself and others, so make sure you choose the most positive words and affirmations that you can. You want to increase the light in your life, not the darkness, and you can do that by speaking words of love and acceptance, not hate and resistance. 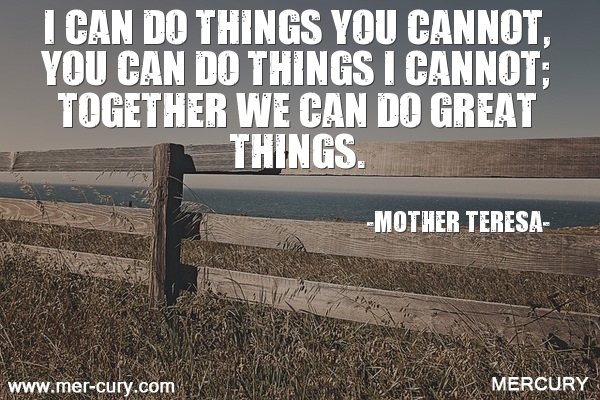 If you want to help the world become a better place, then do what you can. You may not be able to help a lot of people, but helping one person can have a huge impact on their life and the lives of people around them. Instead of focusing on what you can’t do in life, always focus on what you can do. When you see an opportunity, no matter how small it is, take it. An important thing to add to the meaning of this quote is that you don’t have to give money. Changing the world involves more than just money. Time and energy are also required, and we all have the ability to give that to others. 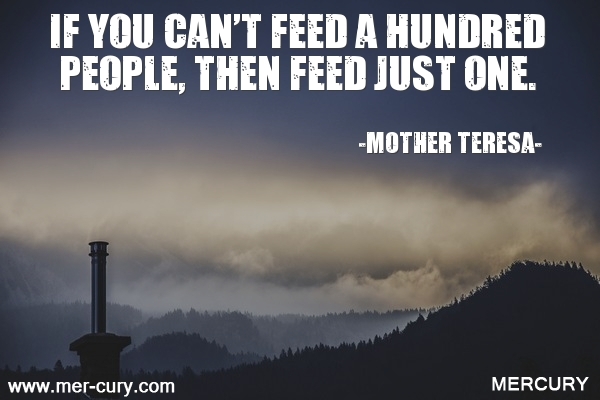 Therefore, if you can’t even feed one person, then spend some time and energy to make their life better in a different way. Help them out. Offer them love. Be someone who they can depend on. It will all have a positive impact on their life. Make it a golden rule in your life to make people happier for seeing you, and you will thrive in all of your relationships. If you concentrate on how you can make others happier, then you will do things that help you improve your relationships. You will think before you speak. You will not be rude or mean or judgmental. You will even listen better as you try to figure out how you can make them happier. While this will benefit all of your relationships, it will also help you make more relationships. Since relationships can help you get opportunities in life for more success and happiness, this is a small little tip that can have huge benefits for you. 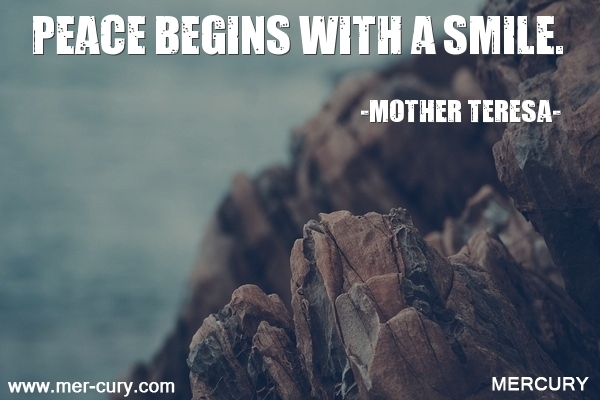 If you want to make peace with someone, smile authentically. Your smile has the power to affect their emotions in a positive way and completely change the way they view you. Even if you look at pictures of Mother Teresa, you will find yourself feeling more kindly towards her when you see pictures of a smile. That’s the power that a smile has. I have been in an argument with a loved one and still couldn’t resist the temptation to smile when they did. A smile is truly contagious. And research has found receiving a smile to be as stimulating as receiving a large amount of cash, which will definitely make whoever you are smiling at feel better. Don’t lock yourself away from the world. Get out there and influence other people’s lives in a positive way. Choose to make a difference on the people around you. Your friends and family members included. If you choose to become a hermit and lock yourself away from others, or to not be an important part of someone’s life, then you are choosing to do yourself a disservice. The greatest power you have is to affect other people’s lives in a positive way and when you choose to make yourself unimportant to other people, you choose to be nobody to anybody. This is true even if you are in other people’s daily lives. For instance, even if you are in an intimate relationship, and you choose to have an indifferent relationship with them instead of a passionate one, you are choosing to be nobody important to them. You are not making their life better or affecting them in a positive way. You are simply there and in their life. Why not remember your importance and stand out in their life? 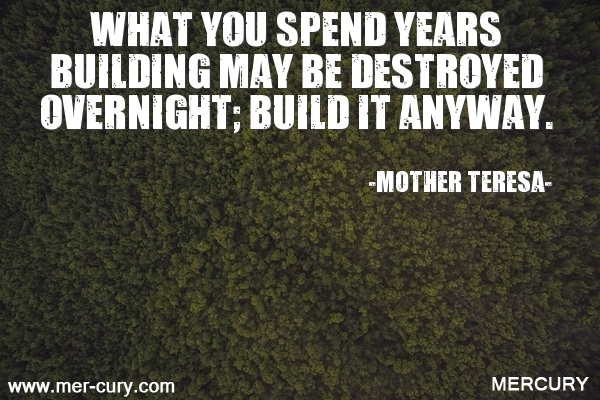 Often we avoid doing something good because we feel like it may all crumble and our efforts will be in vain. The truth is that everything might crumble! All the hard work you put in might have nothing to show for it. But, there is something more valuable that you will gain in the process. When you spend years doing anything, you build knowledge, skills, and awareness. Those are things that can never be taken away from you. That means that if you had to do it all over again, you could. In fact, you could do it faster and better the second time around. So, don’t view any effort you put forward as a waste of time. Everything you do has benefit, even if you have nothing to show for it in the end, you can still feel the growth that you have experienced inside. Do you feel like you have to do it all? You don’t! You just have to do what you can and want to do really well. There are other people out there who can work with you to bring things to life that you want. This often applies to business. If you have a great skill set for reaching out and socializing with people, but you don’t have the ability to do the accounting, brainstorming, or the finer details, then you may try to learn everything before you start a business. But, the best approach would be to reach out and find other people who have a great skill set in accounting or problem solving and work together to create a business where every area has someone who excels. That’s when great things are created. 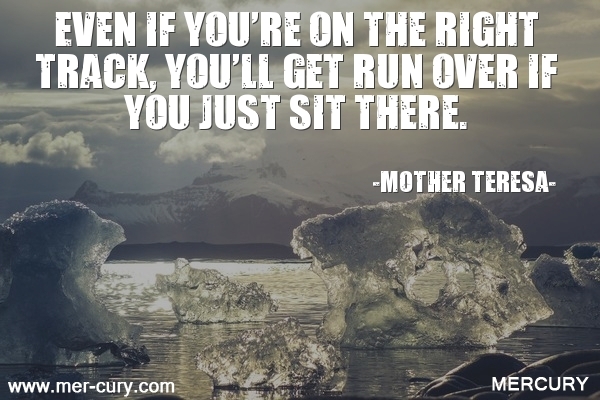 You know what you want, you know how to get there, but do you know that you need to keep moving? You can’t sit around and wait for the perfect time. If you do, other people who know what they want and how to get there will run over you and achieve the success that you want. If you are lucky enough to figure out what you need to do, then do it. Get excited and take some massive action to help you find success faster and ensure you are always in a position of success. The more action you take, the easier it will be, and you will find that nobody will be able to steal your thunder or hold you back. If you feel like you are right or perfect, then you will close your mind off to helpful suggestions. These suggestions may help you have more success or happiness. They may help you achieve better health. They may help you find the relationship of your dreams! Closing yourself off to other people’s insights is going to be a hard blow to your life. That’s why you need to remember that you couldn’t be perfect even if you tried, and there is always room for growth. The only way to grow is to learn. And the only way to learn is to take in new ideas and try new things. Therefore, always look for the insight you need to become better in life. I strongly believe that money is not evil unless you become greedy with it. When you hoard your money and would rather buy yourself something needless instead of help someone else out, then your money has become a harm to the world rather than a benefit. 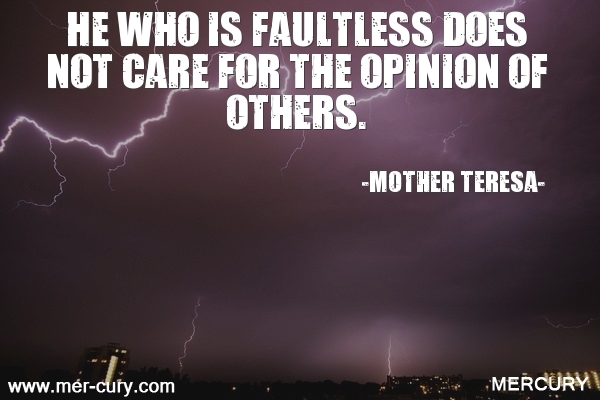 If you are debating whether or not you need something, this is one of the Mother Teresa quotes to remember. It will help you decide if you are just buying something because you can or because you really need it. If you feel guilty, then you probably don’t need it. You probably could spend a small portion of that money to help someone else out to get something that they actually do need. And in doing so, you get much more than you would if you were to spend it on that thing that you don’t really need. You will get the satisfaction of helping someone else and knowing that you did something good in the world, and that will boost your self-worth and, in turn, help you make even more money, which is a win-win for all. 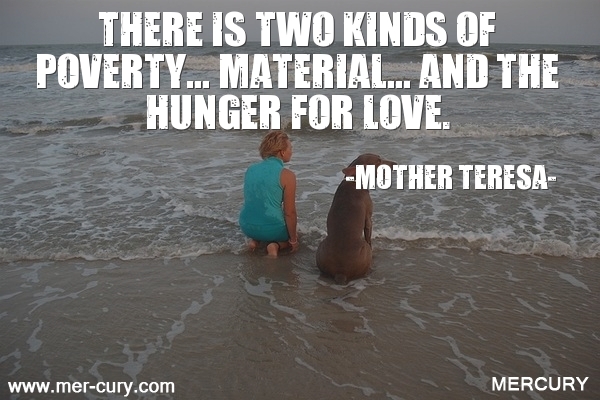 Mother Teresa said in one of her interviews that poverty is not just about being poor and hungry, it is also about feeling unwanted and unloved in life. She talks about how some people are abandoned by everybody and there is a feeling of not being noticed. Not just in people who are homeless, but even people who are in our own home! We all want to be noticed and loved in life, and by doing so to the people around you, you are giving them something that can make them feel rich beyond their dreams. I have a great example of this. My friend’s husband lived in a crappy family. His dad ignored him, his mother was more concerned with herself than him, and he was sent overseas for most of his childhood because they just didn’t want to deal with him. He lived with relatives who also didn’t want him, and he spent years feeling alone and abandoned. When he came back to his parents, they still treated him poorly, and he felt very low about himself. But, when he met my friend, she validated him as a person. He started to feel loved and, because of that, he started to go after more of the things he wanted in life. He turned out to be one of the most loving individuals I’ve ever met, and he has contributed a great deal to this world, which he may not have done without his wife’s love. In other words, make everyone feel wanted in your life. You may be giving someone the currency they need to do amazing things for themselves and other people.